Congratulations! You just got the job of a lifetime as a social media consultant in a big firm. Your task is to imagine a great digital strategy in order to promote the company’s brands, make them more visible on the web, boost the ROI and get more engagement from the community. Now, how are you going to do this? Tricky question and one might head straight into those bad habits that could ruin a career (and a brand’s reputation). Here are nine bad habits you should simply forget about and tell your team never to use, under any circumstance. This is the number one bad habit. Widely used, though. While the web had its period of “soft lies”, it is now taken for granted that fake accounts are a risk you shouldn’t take. Many companies have tested it and many have faced big fails. In 2005 in France, the brand Vichy created a fake blog. Originally, the blog was supposed to be written by a young woman who had tested a cosmetic cream and “loved it”. As soon as the truth had been uncovered, the brand was attacked by real bloggers as well as challengers (of course!) and some journalists. This example is one that is taught in all marketing schools. This is the one “hot trend” brands got into lately. Be it during a hurricane or blackout, some brands didn’t hesitate to use difficult situations in their communication. Well, dear community managers, you need to know there are things you can’t make fun of. American Apparel tried it and the reactions weren’t the ones expected. Of course, a community manager represents the brand (or client, or firm…). Hence, there is a great chance the account is already existing and, if it isn’t, it will go on after the person handling it leaves the company. Therefore, it is frequent that an account is created with an avatar. The avatar has a “voice” but this voice is that of the avatar, not the community manager’s. Once in the “role” it is easy to say things without really thinking them over, taken that “it’s not me speaking, it’s the avatar”. Great! Now think: what if your employer asked you to use your own name? How would you handle things? In fact, you can and should tell your story. However, you shouldn’t only tell your story. Social media is social. Social induces interaction. Interaction means both ways: you tell your story but you also listen to your community. What do they want? What do they think? What do they like? What would they like? Ask them questions, post messages to make them know you think about them in other terms than a simple target for your well-marketed messages. It happens: sometimes, your community doesn’t agree with you. Sometimes, one person will even attack you on your Facebook page, saying how bad you are and how disappointed they are. It will happen, it’s a statistic. The more fans and followers you have – and as you are trying to increase the numbers, you are heading straight into it – the bigger the risk. The one and only rule is to answer in order to avoid a a href=”https://econsultancy.com/blog/63352-are-you-heading-for-a-social-customer-service-fail” target=blank”>British Airways’ kind of fail. Provide the question or attack with a proper answer. Not a ready-made one, a personalized one. In most cases, it will at least help show your will to do things right, while for the best your criticizer might become your best ambassador. Numbers are for dummies. Don’t get me wrong: of course, having many followers and fans is great, especially if they interact with you. However, thinking in terms of numbers is one of the worse ideas in social media. Even though clients and managers like to see the numbers grow, they are no proof of an efficient strategy. Would you rather have 10,000 fans, 500 seeing your posts and 100 sharing or 1000 fans, 400 seeing your posts and 50 sharing? If you go for the first numbers, you’re wrong: your community is less engaged and even if you make it grow, the ratio will probably remain the same whereas in the second case if you build your community following the same path, the day you reach 10,000, you will have 4000 seeing your posts and 500 shares. This might seem rather logical but the facts show that, unfortunately, too many community managers still think checking information before publishing is an option, not a requirement. This means checking any type of information that hasn’t been provided by any other source than an official one as well. If working worldwide, the uses and habits of a specific region should also be part of this little audit: sometimes, symbols, colors, elements of language vary and spending a few minutes making sure everything is alright might avoid uncomfortable situations. 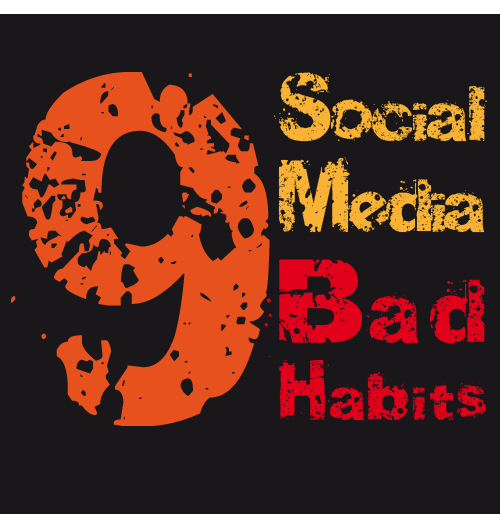 Avoiding those bad social media habits isn’t enough to enhance digital visibility but it might save your e-reputation. Too many so-called digital specialists keep on thinking the web with old-school marketing techniques that belong to another age. Those habits tend to stick around, not being sufficiently pointed out for the risk they represent.